Herb Bennet also known as Wood Avers and St Benedicts Herb, is easily overlooked as it flowers at the same time as Buttercups and often in close proximity to them. So a casual glance and all you will see is small yellow flowers. Even the leaf of Herb Bennet is similar to a buttercup leaf. The flowering period is quite long from May through to August. It is part of the rose family and there are several ‘garden’ varieties of Geum. These come in a wide range of colours and with double and single varieties. The root tastes of cloves and is best picked, washed and dried as the clove taste grows in intensity after drying. Not so exciting! Also I have read that the leaves can be picked and deep fried and then they will puff up like prawn crackers which sounds like fun… I might give it a go next time I find some Herb Bennet. The photo below is of the seed head and as you can see each seed has a little hook on the end, so its dispersal mechanism is by animals with the hooked seed getting caught in the fur of animals like rabbits but also on the trousers or socks of humans. There is a similar plant called Water Avens and it has pink rather larger flowers. It will also grow in wet woodland and if there is any Wood Avens about then it will hybridise with it. This results in a complete range of flowers from pure yellow through lots of intermediate forms to the pure pink of the Water Avens. Along the way you get some very attractive apricot coloured varieties. Herb Bennet and St Benedicts herb got me wondering about why this name. Well St Benedict was from Nursia in Italy and he founded the monastery at Subiaco in Italy, circa 529, it was the first of the dozen monasteries he founded. The Benedictine monks wore black habits. It was claimed that the liqueur Benedictine was first produced in the Benedictine Abbey of Fécamp in Normandy, and that the monks had developed a medicinal aromatic herbal beverage. 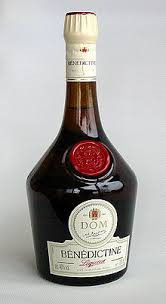 However it was actually invented in the 19th century by Alexandre Le Grand, helped by a local chemist, and he told the story about the monks to connect the liqueur with the city history and to increase sales. The ingredients are a closely guarded secret but along with several distillations it is known to contain 27 herbs and spices, of which the following 21 are publicly known: Angelica, hyssop, juniper, myrrh, saffron, mace, fir cones, aloe, arnica, lemon balm, tea, thyme, coriander, clove, lemon, vanilla, orange peel, honey, red berries, cinnamon, and nutmeg; leaving 6 unknown ingredients. I wonder if one of these is Herb Bennet, maybe the clove flavoured roots? Anyway the name St Benedicts herb is said to be a corruption of blessed herb and maybe nothing to do the actual Saint Benedict. It was blessed because it was supposed to ward off evil spirits….hmm! Lets just call it Wood avens.